María Magdalena Campos-Pons at the National Portrait Gallery this Saturday! WHERE: Smithsonian’s National Portrait Gallery Robert and Arlene Kogod Courtyard Eighth and G streets N.W. One of my favorite artists on the planet, María Magdalena Campos-Pons works with her husband, saxophonist and composer Neil Leonard, to reinsert the black body into historical narratives. Under the name FEFA, they use personal stories, music and procession to evoke both protest and devotion. Born in Matanzas, Cuba, Campos-Pons is an internationally recognized artist known for pushing the art of portraiture in new directions through her large-format Polaroid photographs and immersive installations. Drawing on her ancestral roots in Nigeria and her childhood memories of Cuba, her performances confront the complexities of history and race. This performance will begin in the museum’s Robert and Arlene Kogod Courtyard. Visitors will be invited to join a procession as it continues through the museum to George Peter Alexander Healy’s portrait of President Abraham Lincoln; it will conclude in the front of museum. Esteemed jazz trumpeter Terence Blanchard, a jazz band from the Duke Ellington School, a Cuban band and additional performance artists will employ recitation and reenactment in this historic event. IDENTIFY is the National Portrait Gallery’s first-ever performance art series, which focuses attention on activism, visibility and experimentations through portraiture. More information is available at npg.si.edu. Ben Tolman Sarajevo Drawings Open Today! One of my favorite DMV artists, the superbly-talented Ben Tolman has returned to the DMV after spending several months working in Sarajevo. 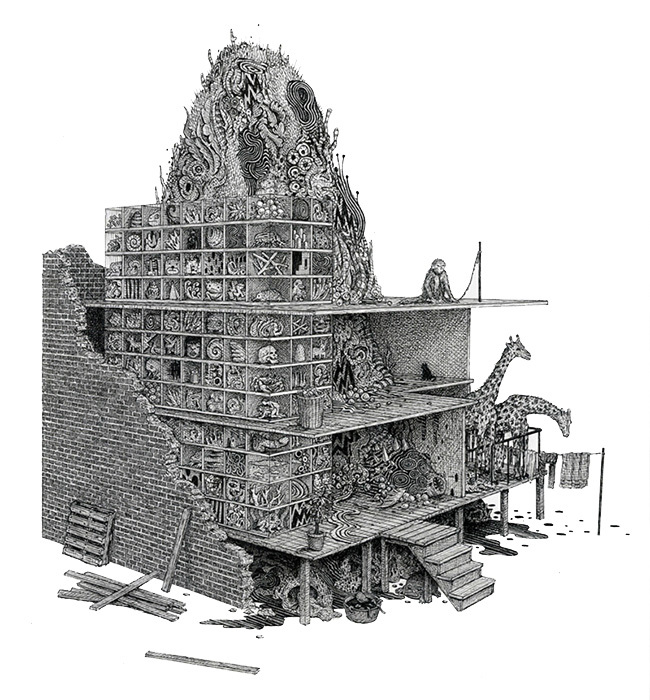 Tolman’s new drawings series expounds on his detailed, almost surreal urban landscapes. For more information and to see the drawings online, click here. (Re) Invention: Art + Innovation + Disability + Design is a juried exhibition of emerging young artists with disabilities, ages 16-25, that aims to showcase artwork created at the intersection of technology, innovation, and disability. Fifteen finalists share a total of $60,000 in cash prizes: first place receives $20,000, second and third place winners receive $10,000 and $6,000 respectively, and the remaining twelve artists receive $2,000 each in awards of excellence. Winners attend a two-day all-expenses paid professional development workshop in Washington, DC, with guest lecturer and teaching artist opportunities. The winning pieces are exhibited in a year-long national tour. Artwork in any medium is accepted, deadline for submissions is June 1, 2016, at midnight.